Discussion in 'Colored Gemstones' started by petit_bijou, Feb 7, 2014. Why do I torture myself by coming back to look at more pictures? Hahah! I'm so flattered that you feel tortured by your pics! I couldn't even begin to count the HOURS that I have spent admiring your pieces - especially your colour change spinel! Is it a Luc Yen? Enjoy your new piece. Congratulations on your engagement as well. Thank you TL! Yes, it is a Luc Yen. It doesn't have the shift to as pure a pink as other Luc Yens I have seen, but I love it just the same. That is a magic spinel! Just magic! I can't get over all its colors & its brightness. It shines right out even from a distance in the photo with the horse (super horse btw -- I'm jealous of that too)! Brad did himself proud on that one -- and congratulations for being its lucky new owner. It's gonna mesmerize people the rest of your life! Thanks Laurie! I can't get over its brightness either. I definitely couldn't be happier with all the help we received from Brad - despite all the "almost" purchases, he always kept me in mind when he came across what he thought I was looking for. "Whenever someone tells me to feel guilty, I assume they're trying to program me." "It's called KARMA, and it's pronounced HAHA"
Once again I am here ogling and longing. Oh, well done! Congratulations! It is so stunning from all angles! I am so happy it just came together like that for you! I love it!! Congratulations, that is an original and stunning e-ring!! Congratulations on your engagement! The stone and ring are beautiful! That is absolutely stunning. What kind of wedding band will you wear with it? Congratulations! I LOVE the color. It's so unique. That spinel is so gorgeous! It looks beautiful in the setting you chose. Best wishes on your engagement! Your spinel is stunning! Definitely a dream worthy stone! I love love love that colour I'm glad you've finally found your dream stone! What a lovely ring. Big congrats on finding "the one." That stone is INCREDIBLE. It would look so phenomenal in a three stone or delicate halo. Also looks amazing in its solitaire! Fantastic job! stunning! just unbelievable in the low light shots. what will you do for a wedding band?? seeing it next to that nice diamond band on your hand makes me so curious! Oh it's perfect. Congrats on the engagement and your beautiful new stone. Thank you everyone!!! I love it so much more knowing that at least the PS community appreciates how special and rare the stone is. Not that it hasn't generated a lot of interest from my less gem-knowledgeable friends, but I'm so used to reading the boards that all the "what's spinel?" questions came as a surprise at first. I'm not sure about a wedding band yet, especially since I am sentimental- so I will want to keep the band even when we eventually re-set the stone. I'll probably go with a plain band to start, so that when I'm camping or working in a situation when I don't want to risk my e-ring or a diamond band, but will likely also add a sparkly band for an anniversary or special occasion. I purchased a channel set band with 12 2-pointers from D&T, and it looks quite nice with my e-ring so it will be a good sparkly alternative or an option to wear with the plain band when I want to go low-profile. Rosebloom - those are all thoughts I've had for the re-set too! That's part of why we are going to take our time - I have NO clue what I want! I change my mind from delicate halo, to bezeled side-stones (like Little Sparkle's gorgeous Leon https://www.pricescope.com/community/threads/bad-pricescoper-fantastic-avc-lm-creation.161471/), to a MM solitaire to... There will definitely be a thread when we get closer to help me choose!! Wow - somehow I missed this baby the first time around but it is simply divine!!! Absolute holy grail of colour and size. 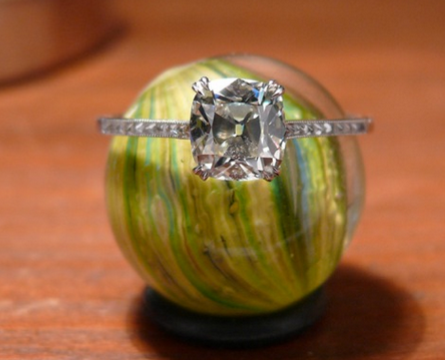 So glad you finally found your dream stone - it's absolutely beautiful. I love nothing more than a colored stone engagement ring! Congrats to you and Brad. Really, really lovely stone. Congrats on your engagement! Littlesparkle's LM is one of my favorite classic settings on PS. I don't think you'll ever get bored with it, and if you get slightly heavier prongs, it should be more durable than a halo. I also like your stone just as a solitaire, and your idea to use stackers to give it a fresh look. Thank you so much HotPozzum, sphenequeen, pregcurious and kgizo! I honestly love it more and more as time goes on. I keep uncovering new personalities it has in different lighting environments. Sometimes it has this sleepy kind of quality that just glows with pale lavender and pink that I cannot capture in photos for the life of me. I love it as a solitaire too - I think it can really stand up on its own without needing embellishment, but I also sometimes think that a perfectly executed milgrained bezel or halo would really set off how delicate the colour is. Who knows... I'm going to enjoy it as is for awhile, especially after I worn it with a wedding band. Hi Petit! I was wondering if you had an update on what kind of band you chose and if you changed the setting? Obsessed with your stone! petit_bijou and NKOTB like this.